Paintballing is a sport when the way to get someone out is to hit them with a bullet of paint and it breaks. If the paint doesn't break on them they are not out. 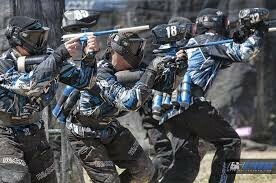 They are different ways to play paintball. You can do woods ball, that is in the woods. You can also play speedball, which is when your bunkers are blow up bunkers. My favorite is speedball. This is a person playing a woods ball game. This is a team called Dynasty playing speedball. This is someone getting bunkered. There are many different games to play in paintball. There is capture the flag, x-ball, elimination, ironman, and many more. My favorites are x-ball and ironman. In X-ball the ways to win is to break a paintball on everyone or bring the flag from in the middle to the other side. In ironman there is only one way to win and that is that you have to surrender to get out. That means you could get shot one million times and don't have to go out. There are many different levels of paintball. There is D5, D4, D3, D2, D1, D1 is the pros league. That's the best league to play in. 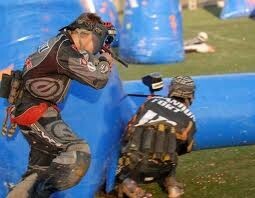 D5 is the league your in right when u start a paintball team. My paintball team is in D4, and are team name is the dream team. "Paintball." Wikipedia. Wikimedia Foundation, 11 Oct. 2014. Web. 10 Nov. 2014. http://en.wikipedia.org/wiki/Paintball.